With US equities seeing significant weakness across the day, the VIX was back on the rise, settling +21.9% @ 19.62 (intra high 19.76). The key 20 threshold remains difficult to break/hold above, and if sp'2044 was a double floor (as seems very possible).. then VIX will cool from the 19s.. all the way into August. 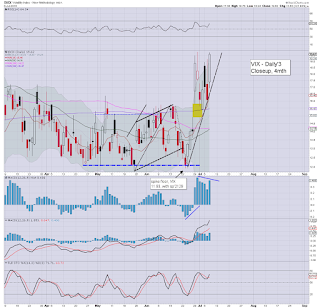 It is entirely possible we have seen a double floor of sp'2044, with a near perfect double top of VIX 19.80/76. The next day or two.. should give clarity. Best guess... equities are set for broad upside.. back into the sp'2100s.... into August, which should cool VIX back to the 13/12s. Well.. that was quite a day, wasn't it? Early morning weakness.. as expected.. then the NYSE going offline... with the market melting lower across the afternoon. Price structure is offering a double floor of sp'2044. 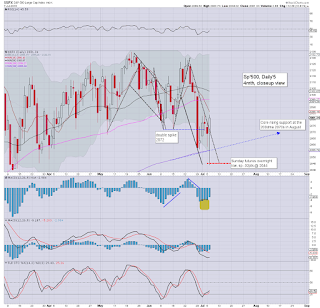 US equities have seen another wave lower, with the sp'500 -36pts @ 2044.... testing the Tuesday low. 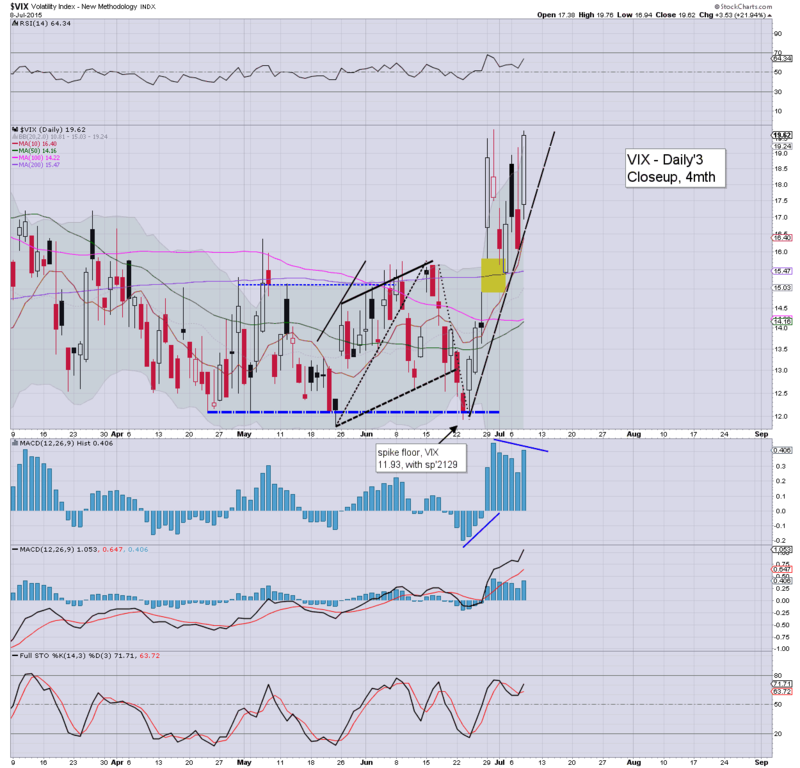 VIX is reflecting increasing concern, +22% in the 19.60s. Gold is holding gains, +$6, whilst Oil -2.4% in the $51s. *VIX is increasingly twitchy as the market continues to cool. Price structure is offering a double floor of sp'2044, with a slightly divergent lower VIX high of 19.74. 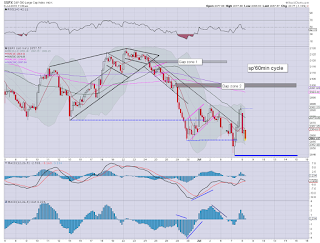 Market is set to claw upward into the close..... ALL cycles favour it. 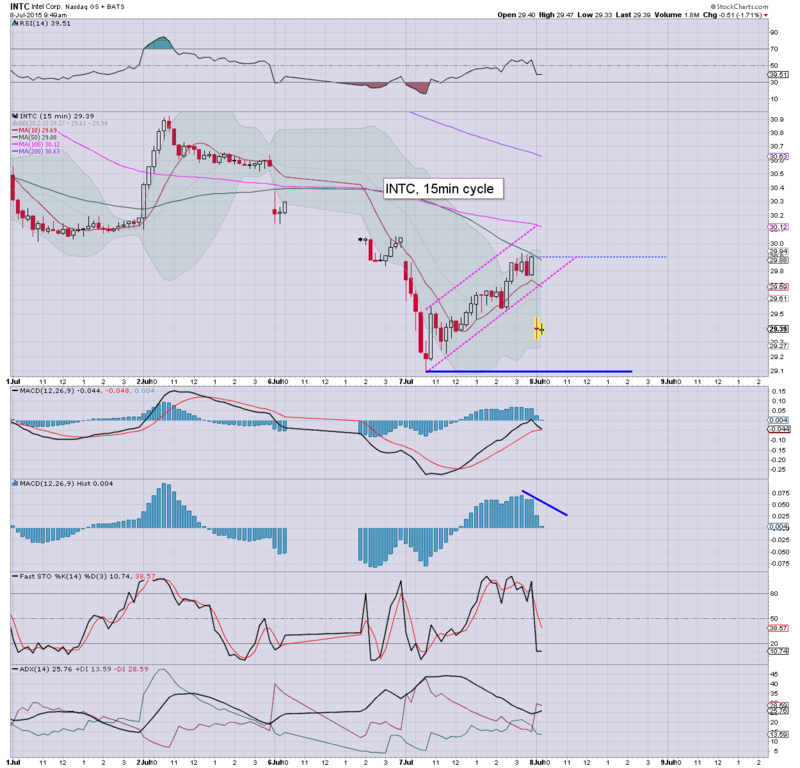 3.26pm.. A lot of price chop around sp'2050.. with VIX in the low 19s. Overall. I am not concerned... and I will hold LONG-INTC overnight. 2pm update - just unplug... replug! So... the NYSE is still broken.. and is not exactly inspiring confidence in the cheerleaders on clown finance TV. 2.34pm.. Well, its typical turn time.... in theory.. upside into the close.... but with the NYSE set to open soon... things could get a bit choppy. 1pm update - really, then why are you people here? US equities remain significantly weak, sp -28pts @ 2053. However, with the NYSE currently out of service, trading vol' has naturally fallen to near zero. The issue now is whether the NYSE will be back up before the close.. if not.. it would be a real problem for some traders. Just another crazy day in market land. Regardless of the current technical drama, from a pure cyclical perspective... market is still set to battle broadly upward into August. A few floor spikes.. are a good sign. As for the broken market... was it Bane? US equities are battling to build a floor, with a moderately higher low of sp'2055.. relative to Tue' 2044. 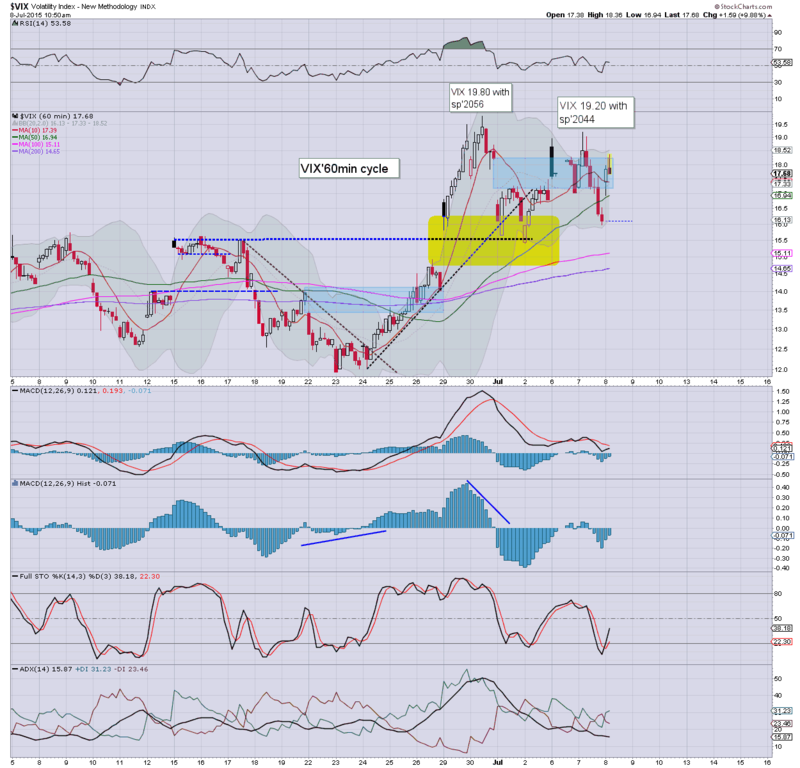 USD remains notably weak, -0.6% in the DXY 96.20s. Metals are holding gains, Gold +$6. Oil remains weak, -3.3%... in the $51s... after an inventory net gain of 0.4 million barrels. Meanwhile.... NYSE trading is entirely offline... clearly.. a healthy market. So.. err.... interesting day huh? 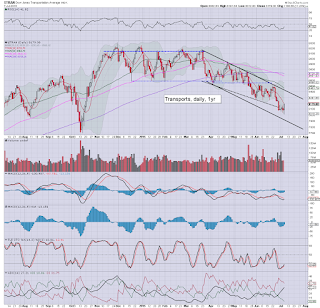 With the trading HALT, new lows in sp'500.. 2053. VIX +15% @ 18.60s. 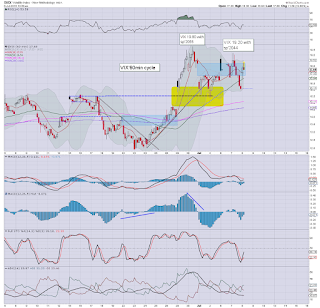 Again, the $29s are holding... in theory.. INTC should be able to battle upward to at least the $31.50/32.00 zone. 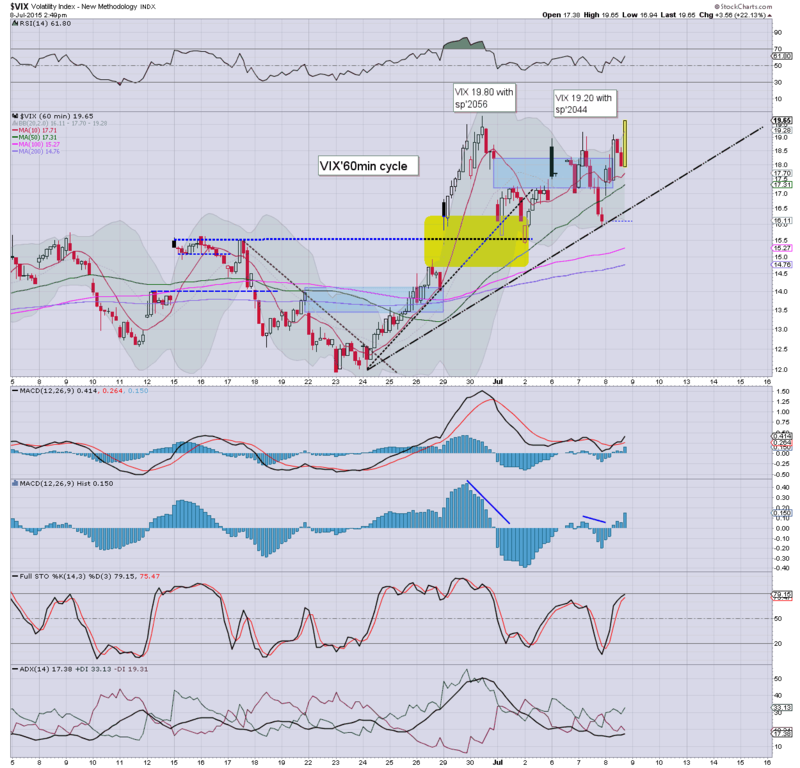 time for a valium.. or something (it is rarely easy being long this market). 12.02pm.. okay my mini legion.. this is starting to get a little crazy. Sure... other exchanges are still active.. but the mighty NYSE is currently still broken. Is it done for the rest of today? Is this the ultimate signal of doom? stay tuned!!!!!!!!!! 12.11pm.. NYSE - all OPEN ORDERS cancelled... so.. that'll really annoy some out there... and I'd guess most will have to be manually re-entered, rather than batch entry. What is clear... the maintream really striving to not say the word 'hackers'...or that the system is vulnerable. 12.19pm.. So.. err.. when the market reopens.. that is bullish right, and good for at least 100 Dow pts? 12.27pm.. Ohh CNBC has brought on the Cramer.... now I feel so much calmer... and I certainly won't mention the notion that hackers might be responsible. Just like yesterday morning, market is now due a move higher into the mid afternoon. 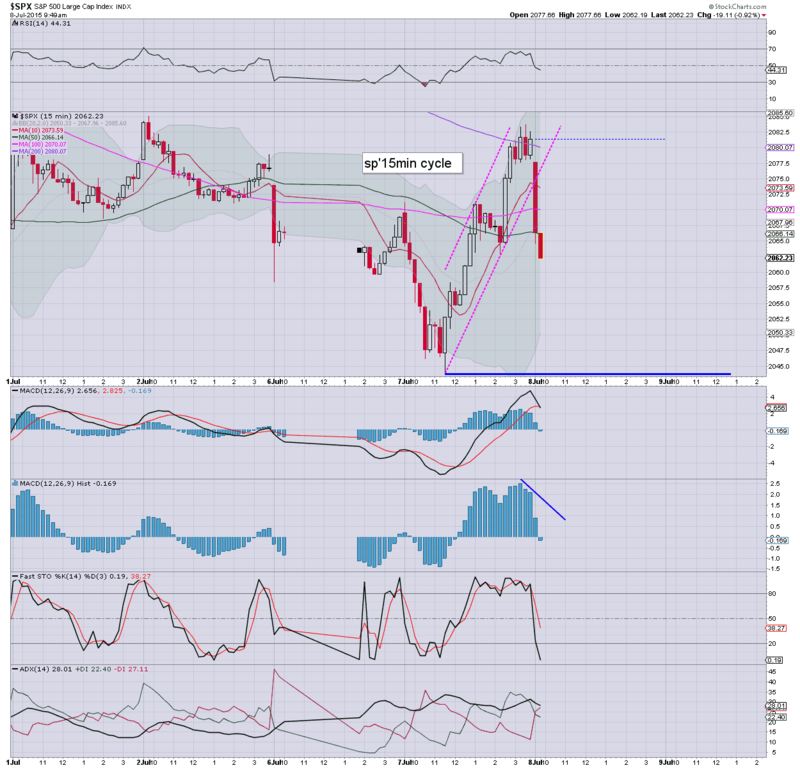 The hourly candle is already offering a spike floor of sp'2056, with VIX having maxed @ 18.36. Metals are holding moderate gains, Gold +$5.. whilst Oil is -2.3%. *an early lunch.... bear with me..
11.02am...Well, it is typical turn time... market should in theory have another fair chance of turning positive by 2pm. Again, its notable that the VIX put in yet another lower high.... again indicative of exhaustion in terms of equity downside. 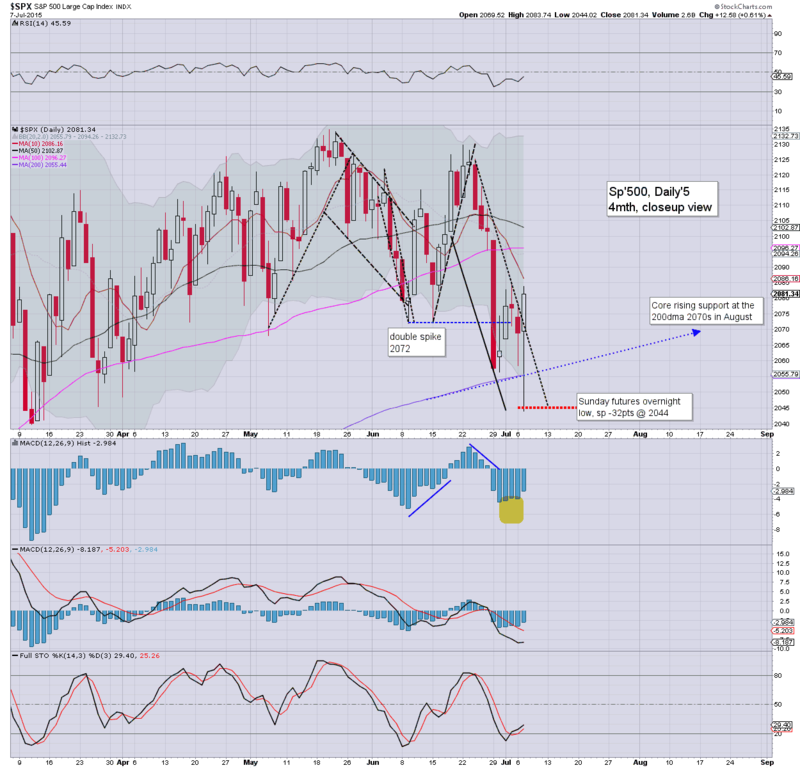 The sp'2100s look viable within the near term. 11.10am notable weakness, Alcoa (AA) -4.2%.. ahead of earnings... due at the close. 11.23am.. notable weakness in the USD, -0.7% in the DXY 96.10s. From a pure cyclical perspective.. this downside is expected.. and should last into early August... which will help most asset classes. 11.26am.. Market testing the 200dma of sp'2055..... pretty choppy though.. and so far.. less twitchy trading than yesterday. 11.33am.. Market trying to put in another floor-spike candle.... a move back into the 2060s would confirm it. Who is getting dizzy from all these swings? US equities open moderately lower, but the Tuesday low of sp'2044 looks likely to hold. The smaller 60/15min cycles are suggestive of a floor in the 2060/50 zone by 11am... a net daily gain remains very possible. USD is bizarrely weak, -0.5% in the DXY 96.30s. *there is a great deal to cover, and my head is spinning today for other reasons... urgh. Maybe I should have bought that bottle of wine in the store just now? Seriously though.. a wave lower was expected this morning.... now its a case of whether we can close positive.. much like yesterday. So long as it holds the $29s... I'll be content to go long in this hour. 9.59am.. LONG INTC, from $29.40. Maybe I'm a bit early.. but I waited an extra.. having watched it hit $29.09 yesterday. 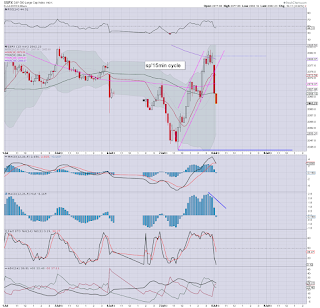 10.10am.. Well, I was indeed early.. INTC immediate drops another 20 cents to $29.20. VIX reflecting some notable market concern.. +12% @ 18.06.... equity bulls should want to see that cool into the low 17s.. by the close. It would seem we have a morning low of sp'2056.. with VIX having maxed out @ 18.34. 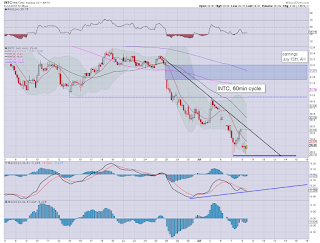 *INTC holds the $29s... with a marginally higher low of $29.20.... the $30.00 threshold is viable late today... I can hope.. right? Good morning. Futures are moderately lower, sp -16pts, we're set to open at 2065. USD is in cooling mode, -0.3% in the DXY 96.60s. Metals are a touch higher, Gold +$2, whilst Oil is -0.7%. *futures have recovered around half of earlier declines, sp'500 was trading -31pts, around equiv' of 2050. We have another interesting day ahead.. as the market is still struggling to cope with the ongoing Greek drama, and the relentless China market implosion. 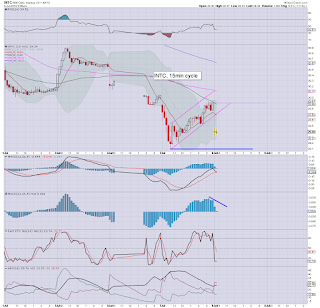 As things are, I expect yesterdays low of sp'2044 to hold. Overnight China action: the broad weakness continues, with a new cycle low of 3421, settling -5.9% @ 3507. The fact we've hit the 'natural retrace' in the 3400s is pleasing to see. I suppose we could drop to 3K in the near term... but I find that a little unlikely... assuming the US market can hold the short term low of sp'2044. As for me, I still have eyes on INTC-long this morning... anything in the $29.60/50s would be pretty tempting. Early pre-market is already offering the $29.60s... maybe I can get 29.40/30s by 11am? *watching Bloomberg, and I'm reminded that Q2 earnings begin today.. with Alcoa (AA) due at the close. Hard to guess how that one might react. 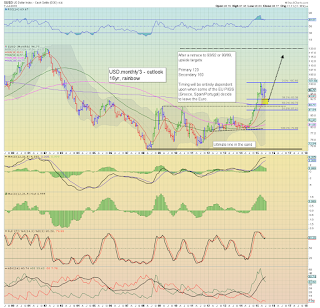 From a pure chart perspective, its due an up cycle, but broadly.. looks headed for the $9s by this Sept/Oct. Lower commodity prices will obviously be a major problem. 9.32am.. 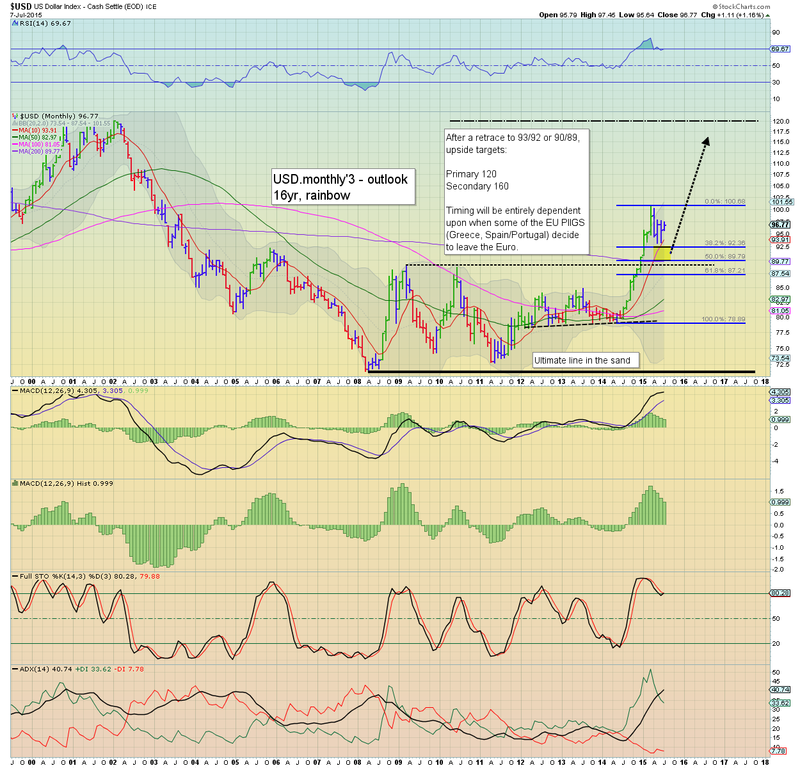 Eyes sharp... on INTC... if it fails to hold $29.00... that would be a real concern to me. As it is.. I'd guess it will hold... and back into the 31s. 9.38am.. As things are.. the 2055/50 zone looks prime area for a floor by 11am. Whilst equities broke a new cycle low of sp'2044, the USD continued to push upward, settling +0.6% @ DXY 97.08. Price structure - since the mid March high of DXY 100.71, remains a giant bull flag... with hyper upside to the 120s in 2016. The daily MACD (blue bar histogram) cycle continues to tick higher, and indeed, is now on the high side. 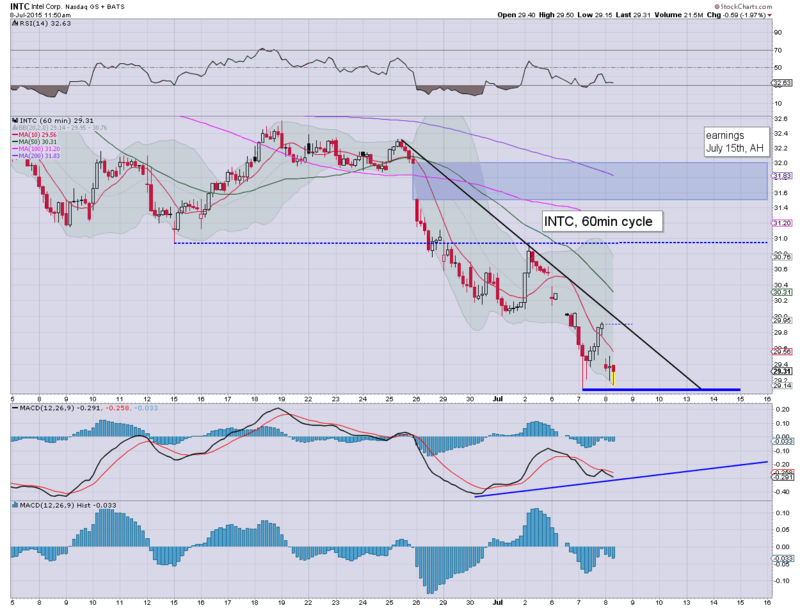 A new down cycle looks due.. which (in theory) should see the USD cool into August. 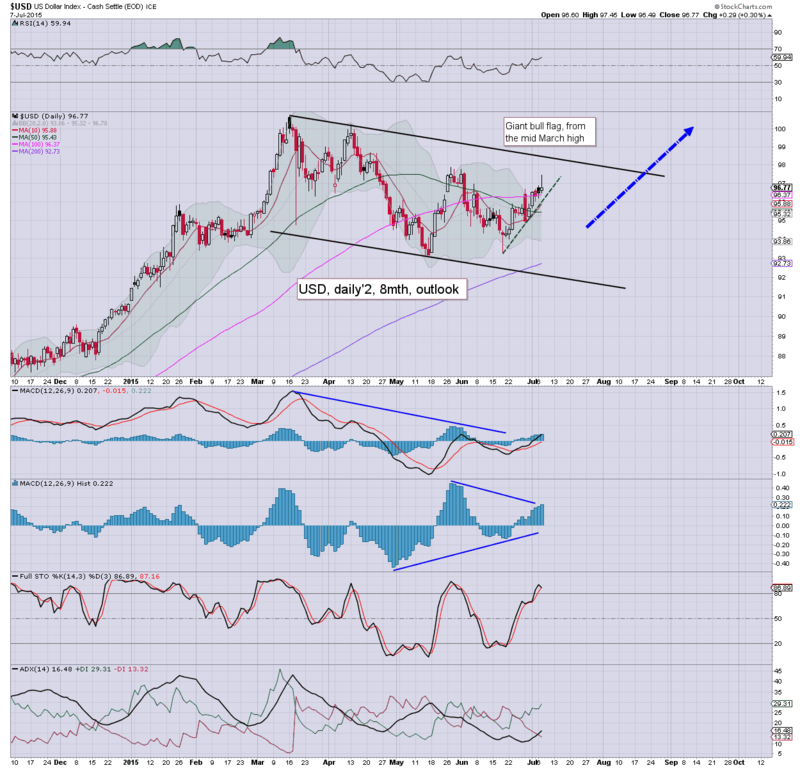 USD looks set to break out and above the bull flag, trend resistance is currently around DXY 98.50... by late August.. 97.50. 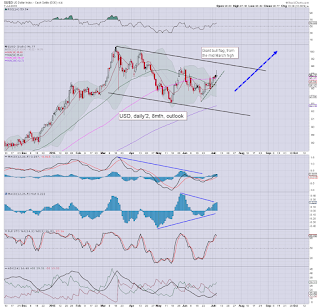 Once a weekly/monthly close >101, its open air to the 120s... although that will of course likely take at least 9-12 months. For the 'dollar doomers' out there, I realise you will vehemently disagree, but then.. would you rather hold Yen, Euros... or (eventually)... Drachma instead? Ohh yeah, some of you are thinking about physical Gold.. or even Bitcoin. Good luck with that. Wednesday will see the latest EIA oil report, and the FOMC minutes. 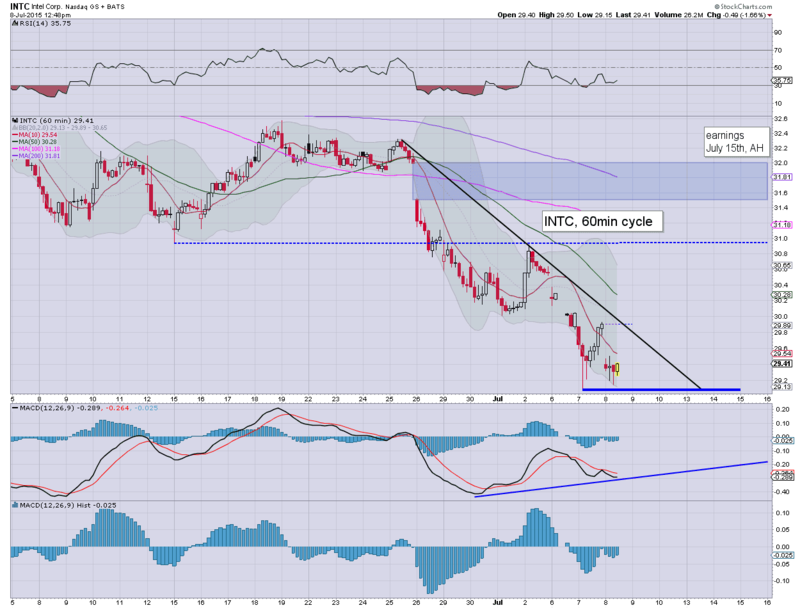 *fed official Williams is speaking at 2pm.. and Mr Market will be listening for any chatter on int' rates.. or even the Greek situation. US indexes closed moderately higher, having swung from a morning low of sp'2044, settling +12pts @ 2081 (intra high 2083). The two leaders - Trans/R2K, settled higher by 1.2% and 0.1% respectively. Near term outlook offers some chop, but with broader upside into August. Suffice to add... it was a day for the equity bears and bulls! Bears had plenty of opportunity to exit in the sp'2040s... whilst bulls had a better place to go long. There are a great many reversal daily candles on many charts, and all are suggetive we have a key cycle low of sp'2044... with VIX having maxed out at 19.80 (June 30th'. 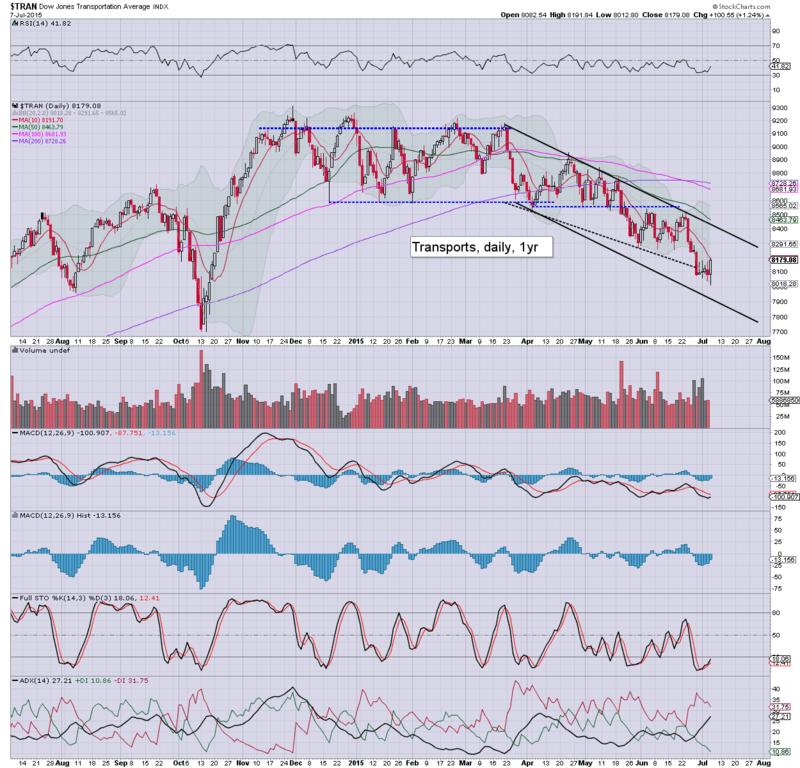 Best guess... 2044 holds as a low... with broad upside into August. Whether some indexes - notably the Dow, sp'500, or even NYSE comp' can break marginal new histotic highs in the next up wave... difficult to say. What is clear... today was surely a day for the bears to have made a run to the EXIT door.